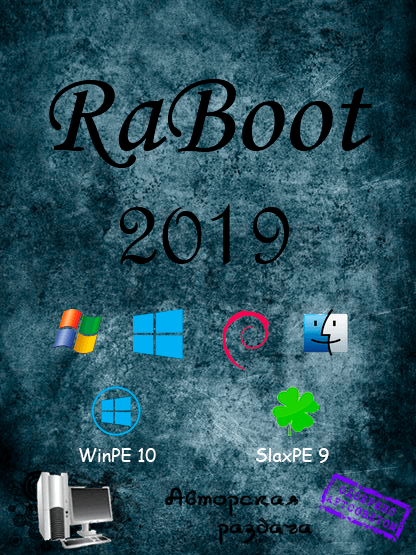 Raboot 2019 Bios Uefi (Win/Mac/Linux) » HEROTURKO.NET More Than You Need! Hybrid build, with a new PE on the Slax Linux kernel. Thanks to the Ra application, you can now not only Windows users, but also Linux as well as macOS, create a bootable device with one click, allows you to add multiple ISO and WIM boot images, in case of damage, can be easily restored without downloading or deleting data. Now the Ra program can already be used in addition to Windows 7+, but also in Windows XP, on Linux systems (Debian Based) and on macOS. New Windows Installer (winstallinux - hybrid), the program works on both Windows and Linux. The program can install Windows from SlaxLinux. The ability to create from an existing drive (no matter USB FDD or USB HDD) a new external boot disk. After selecting the external media, the Ra.exe program itself determines which disk it is dealing with (FDD or HDD) and makes it bootable. In addition to its bootable ISO files, it is possible to add WIM files using the BCD editor Ra. Added and updated operating systems. New PE on Slax Linux 9 kernel. A simple file manager for convenient work with files and folders. The menu in both modes (BIOS - UEFI) is automated - that is, the menu will display only those images that exist, and hide the rest. In Legacy mode, Grub2 has become the main bootloader, but Grub4dos can also be used as an additional one. Optimized all applications, fixed bugs. There is a program WinContig to defragment ISO images (required). Very easy functionality to add bootable WIM images. Added images can run in both BIOS-UEFI modes. When creating a boot device on MacOS systems, the main partition will be formatted in FAT32, instead of NTFS. However, for this assembly it is not terrible, since there are no files larger than 4 gigabytes in it. Again, many thanks to everyone who shared and shares his knowledge online, and naturally to all those who appreciate my work and use it.